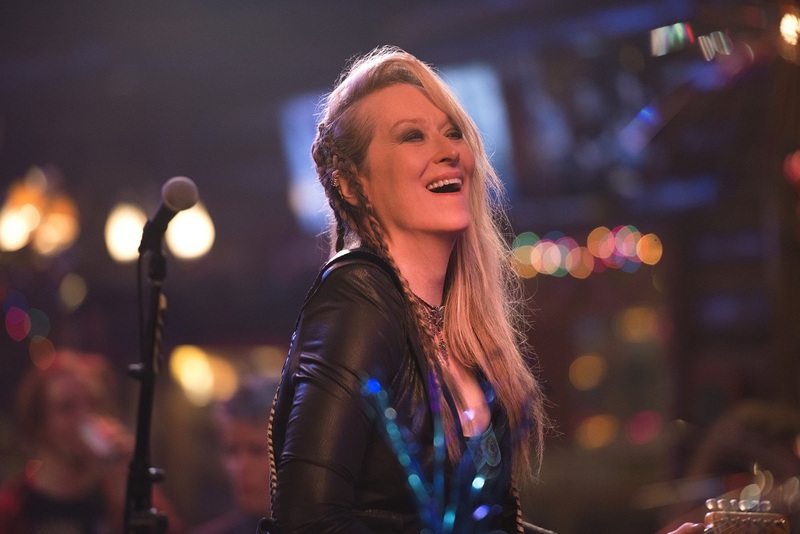 Ricki Rendazzo (Meryl Streep) is a never-was rock star still standing tall alongside her band The Flash in a small California bar doing rollicking covers of everyone from Tom Petty, to Bruce Springsteen, to Lady Gaga. Moonlighting as a cashier at a local Whole Foods-type supermarket, in a relationship with her band’s lead guitarist Greg (Rick Springfield) but unwilling to make any public declaration admitting it, she’s an unapologetic loner who refuses to feel sorry about her life’s mistakes, doing her best to keep on rocking as time, experience and circumstance slowly work against her. Things get interesting when her ex-husband Pete (Kevin Kline) tells her she needs to fly cross-country and come home to help her grieving daughter Julie (Mamie Gummer), the young woman falling to psychological pieces in the wake of a brutally difficult divorce. Having not seen any of her kids, and that includes sons Josh (Sebastian Stan) and Adam (Nick Westrate), in years this is difficult for Ricki. Yet she drops everything and heads to her daughter’s side, hoping some good can come from the visit even if not everyone is going to initially be all that glad to see her again after so much time apart. 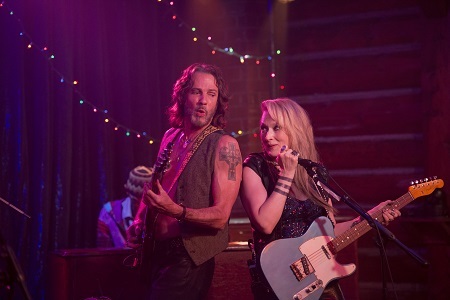 Director Jonathan Demme (The Silence of the Lambs, Something Wild) and screenwriter Diablo Cody (Juno) aren’t attempting to rewrite the dysfunctional family rule book with their rollicking collaboration Ricki and the Flash. Not a lot happens we do not expect. Nothing overly profound or surprising ends up coming to pass. The majority of the central characters evolve as we expect them to right from the first second we are introduced to them. But what the film lacks in originality it makes up in heart, wearing its emotional authenticity on its leather-clad sleeve. Much like the director’s last success Rachel Getting Married, a lot like the writer’s script for Young Adult, the film fearlessly allows these characters to live and breathe like real people, presenting their problems and their difficulties as-is with very little in the way of additional embellishment. Unlike those pictures, it does grant them a momentary modicum of levity and light, building to a fairy tale conclusion of togetherness and family that works far better than it probably should in large part due to the fact getting to that point felt so gosh-darn honest. Unsurprisingly, Streep is a scene-stealer, delivering a performance of depth and power that builds in masterful intimacy one moment to the next. Her scenes on-stage with Springfield and the rest of The Flash are an eye-popping delight, each song building narrative and character, doing it through guitar licks, lyrics and the motions of those rocking and rolling up on the stage. 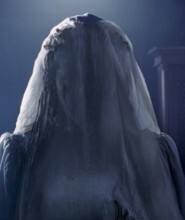 But she is equally magnificent in the quiet moments between her and real-life daughter Gummer (who is equally wonderful) or in cathartic, punch-drunk sequences of give-and-take remembrance with Kline, all of them working in a spiritual tandem that’s every bit as melodious as the musical moments. Demme digs in, he and cinematographer Declan Quinn (Leaving Las Vegas) creating a documentary-like milieu that facilitates connectivity between the audience and the story. The veteran filmmaker allows the performance sequences to shimmer and shine yet never does he forget about the players who’d rather stay out of the spotlight, giving the supporting cast equal chance to make an impression. Meticulously edited by Wyatt Smith (Into the Woods), all the pieces fit together seamlessly, Demme keeping embellishments to a minimum no matter what else might be happening on the fringes of the frame. Cody’s script can get a little cutesy, it’s contrivances plainly obvious. It also doesn’t always know just exactly how to make all of its points, over-explaining on some occasions while at others getting too ephemeral and nondescript about various characters and their respective motivations. But the core stuff, the interpersonal familial plain on which most of the dramatics traverse, that is something to see, the emotional peaks and valleys all ones I found myself happily absorbed in and glad to have been given the opportunity to hike through. In the end, though, it’s Streep who elevates things to the heights they ultimately ascend to. Demme cannily keeps her in the center of the stage, so even when others are shining it is Ricki we’re thinking about. 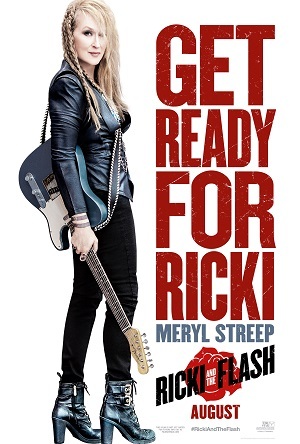 It’s as terrific a performance as any the veteran four-time Academy Award-winning actress has given over the last handful of years, Ricki and the Flash topping the charts in large part solely because of her.